In the winter, there’s nothing we like better than settling down with a cup of coffee or hot chocolate while it storms outside. The most essential part of this picture are the logs burning in the fireplace. Did you know that bringing firewood into your home can mean introducing a variety of new winter pests into the protected and warm environment of your living room? Before you get around to throwing the logs on the fireplace, insects have ample time to warm up, wake up, and wander out of their home in the firewood to explore your house. Having a bunch of tiny critters wandering around your home is the very last thing you want to be confronted with this holiday season. Check out the below guide to find out how to stop this scenario before it happens. These winter pest control tips will keep your home bug-free all winter long! First, we’ll take a look at what sorts of firewood pests you want to avoid. Then, we’ll identify the warning signs of a winter pest infestation. Finally, we’ll talk about how to prevent these pests -- and what sort of pest control measures to take if necessary. We’ve identified several species of insects that are likely to hitch a ride into your home on (or in) your firewood. Many of them thrive in similar conditions, which means that you can take a few simple steps and prevent a whole handful of winter pest species from spending the holidays with you. Many insects are attracted to moist or damp firewood. Large “click” beetles, termites, and carpenter ants are all happy to feast on and nest in wood that hasn’t dried properly. Termites, however, will only invade your firewood if it’s moist and also touching the ground. Termites need to have direct access to their underground tunnels. 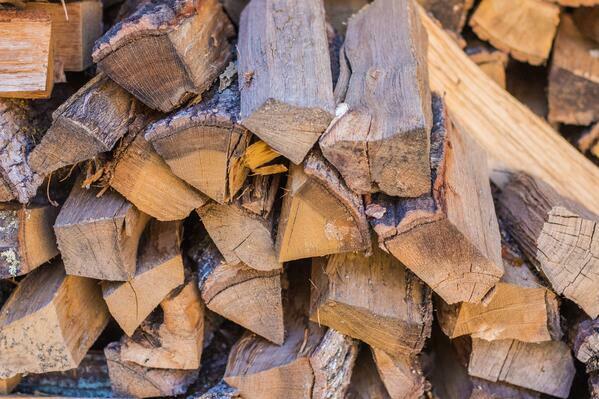 Even if firewood is dry, it can seem like a welcoming environment to many winter pests. Consider horntail wasps and carpenter bees -- they’re happy to lay their eggs in your dry firewood. Beetles lay eggs in firewood, too, which can sit dormant for two whole years before a beetle emerges. Ambrosia beetles and bark beetles are attracted to fresh firewood, but stay for a long time. If you aren’t careful, they could end up in your home. There are many insects that find the space between the bark and the wood to be a particularly habitable spot, even in the winter. You may find roaches, ants, wood-boring beetles, and wasps napping in this part of your firewood. Let the wood sit for too long in your home, and they’ll warm up and decide to take a stroll. It’s very important to inspect your firewood before you bring it into your home. The most telltale signs of a firewood insect infestation are holes in the wood, or tunnels around the outsides of the logs. You can even use these tunnels to figure out what type of insect you’ve got. If the tunnels are covered in sawdust, you likely have a wood-boring beetle issue. On the other hand, if there are trails of mud around the outside of logs, you’ve most certainly got a termite issue on your hands. If you detect these warning signs on your firewood, don’t bring it inside! You’ll be introducing pests into your home. Instead, dispose of the wood. There are several preventative steps that you can take to make sure that insects aren’t living in your firewood in the first place. If you’re buying firewood that’s not completely dry, or cutting your own, you need to make sure that it’s dry before if goes into long-term storage. Read more below to learn how to store your wood so that it doesn't create a welcome habitat for beetles, wasps, termites, and other firewood pests. Store your firewood off the ground using concrete blocks, plastic pallets, bricks, or other non-wood materials. Make sure that your firewood is stacked away from the side of your home. If you have to stack it close, place it at least three feet away from the walls. If the wood is in contact with the walls, insects can bore straight from the firewood into the sides of your house. Never stack firewood next to trees, as any possible winter pests can infest the tree and cause irreparable damage. Never stack your firewood inside, and make sure that you burn it as soon as you bring it into your warm home. When you collect wood to bring indoors, always inspect the individual logs, and wipe off any insects or dirt that you see on the surface. Starting to See Some Insects? Following this guide will keep you as safe as possible from firewood insects during the winter season. But what should you do if you still see some creepy crawlies wandering around your home? Easy: just call Home Pest Control! Our winter pest control experts can properly evaluate your pest infestation and take care of the problem immediately. Call us today! And in the meantime, check out "Winter Pest Control: the Comprehensive Guide to Winterizing Your Home", for everything you need to know about preparing your home for the winter.